Malinda Quiroz essentially lost three family members in one day. SAN ANTONIO — A mother and her pregnant daughter were killed one week ago. The baby died days later, and the killer hasn't been caught. Malinda Quiroz lost three family members in one day. "They are in a better place," she said. Her daughter Janette, and granddaughter Bernadett, who was nearly eight months pregnant, were shot and killed at a South side apartment complex. "It is hard," she said. It is unbearable." Quiroz told us she saw the two just hours before they were killed. The 18-year-old died at the hospital. She was studying to be a nurse assistant and was about to graduate this summer. "She didn't get to be a mom," Quiroz said. "She didn't get to feel to be a mom. My daughter didn't get to feel how a grandma feels." Doctors delivered Bernadett's daughter Tabitha. 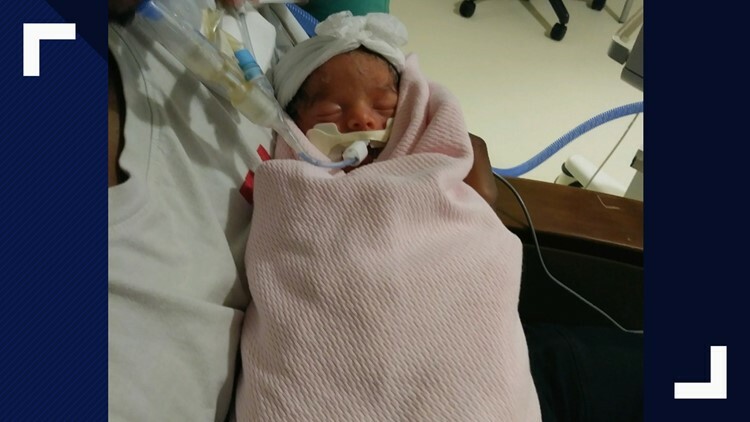 She was born without a heartbeat, and was taken off life support days ago. "All three of them," she said. "But she was an infant. She didn't know better." Police said the shooter is a juvenile who ran from police. He still hasn't been caught. "He doesn't deserve to be out there still hanging and living doing that when my daughters ain't doing that," she said. If you know anything, you are asked to contact Crime Stoppers.